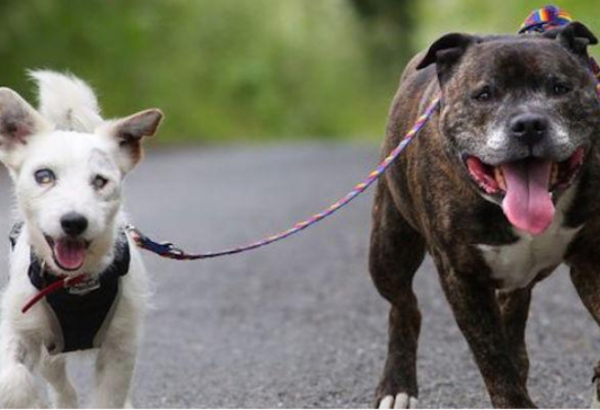 Glenn the Jack Russell is completely blind but luckily has his best friend Buzz as his own personal guide dog. Glenn and Buzz, a Staffordshire bull terrier were abandoned before they were rescued a few weeks ago from a sea tunnel. The two dogs are now at the Stray Aid Rescue Centre in Count Durham, North East England and are both waiting to be rehomed. Buzz leads Glenn around and will even nuzzle him towards the right bowl if the Jack Russell starts eating from the wrong one. “Buzz acts as Glenn’s eyes and it’s as simple as that,” Sue Bielby, a worker at Stray Aid told the BBC.